Interim are a five piece alternative/hard rock band from Australia who’ve previously been championed by their own country’s famous rock radio station Triple J. By the time of their 2015 EP release ‘Metanarratives’ the band sounds more than established – the five songs on this release are of a very high standard indeed, effortlessly mixing hard rock, post-grunge and blues sounds to create a heavy yet melodic style. The heaviness that Interim’s sound sometimes bringss isn’t always so obvious at first, since ‘Jack’ is a multi-faceted slice of alternative rock, often focusing more on the more radio friendly elements of their sound. The guitars shift between a melodic twang and a staccato looped sound, always enjoyable in a radio fashion. Almost at odds with this, frontman Alec Snow possesses a voice that’s deep and almost smoky at times, a voice that taps into a confident rock croon. From the second verse, things gradually step up the pace; drummer Matt Hollonds approaching his kit in a more aggressive fashion with each few passing bars, before the guitars really hit their stride, delivering a deeper, harder riff, heavier around the edges but never losing sight of their original bluesy intent. A few bars of the heavier style gives an insight into Interim’s range, but before long things drop back to the original complex groove. With a rather aggressive sound, ‘Play Your Game’ could almost be a different band. With a heavy groove led by the drums, there’s a passing resemblance to Audioslave, partly down to a slow Tom Morello-esque riff appearing midway, but Snow’s voice is the most enduring element, sounding at times like Chris Cornell screaming under a wall of fuzzy filters. With this number, Interim really go balls out, and its the sound of a band who can barely be contained within their studio environment. Bringing things into a more bluesy sphere – perhaps the band’s strongest musical suit – ‘For Your Love’ showcases the talents of guitarists James Basnett and Lachlan Becke trading melodic riffs throughout. The guitars have an almost timeless tone with their 70s grooves, while Snow makes best use of his gravelly vocal range. It’s good, sure, but it’s during ‘She’s The Devil’ the band really come alive. This track really highlights the crying edge to Snow’s voice – a natural talent – while a mix of acoustic and electric guitars lay down some atmospheric blues rock. A huge slide guitar paves the way for the acoustic base, before reverbed electrics wail. All of this is brought together by Hollonds, rattling out an understated drumline. Many will undoubtedly hear a Zeppelin influence here, but the dark tones and post-grunge elements that lurk beneath and eventually explode into a sledgehammer of a riff owe far more to Canadian psyche-grungers The Tea Party. Those who still have a soft spot for their 1995 release ‘The Edges of Twilight’ will find a great deal to love within this track. The closing number, ‘Way Down’ rivals ‘She’s The Devil’ as the strongest track on this release. This is due in part to some well constructed hard rock riffs and Snow absolutely tearing his throat like a man possessed when putting across the anger within this piece, but the key to its brilliance is a circular piano line repeating throughout. During the quiet sections, this provides something from which the rest of the band can build, but it doesn’t ever subside – even during the more raucous moments – and these are potentially far more raucous than anything else here – it can still be heard somewhere within the huge wall of sound. In terms of bringing various seventies and nineties elements under one musical umbrella, Interim hit their target square on almost constantly on this short release. Triple J know this and undoubtedly there are rock fans in Australia firmly behind them. 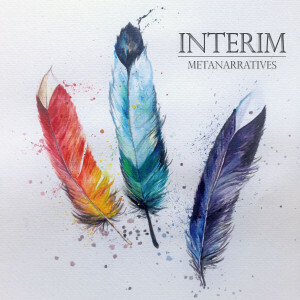 If you like hard rock with a strong groove and slightly retro bent, ‘Metanarratives’ is definitely a recommended listen. This entry was posted in Album & EP Reviews and tagged alec snow, alternative, aussie, hard rock by Real Gone. Bookmark the permalink.